It’s a big, red bird. Very big and very red. Note that the wing feathers also look a little like flames. Note the ever-so-slightly aggressive beak—it’s a raptor, and it can be tough. Note the oversize shoes with the garnet S. Then allow yourself a laugh at the highly shakable tail and the overstuffed appearance of the whole silly thing. 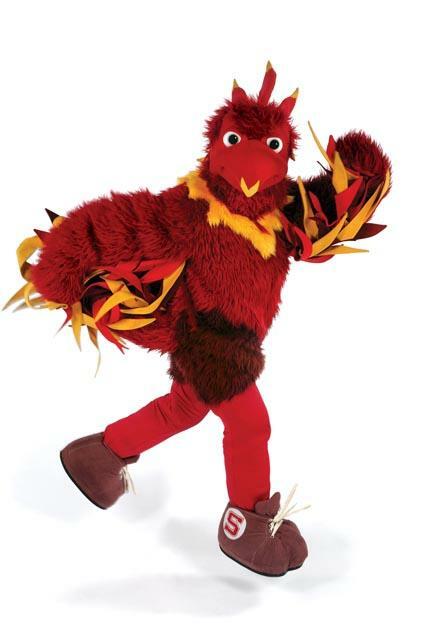 What more can you say about it—except that it’s Swarthmore’s new mascot, the Phoenix! It’s supposed to be fun—and it is. The Phoenix (we’ve decided to capitalize it, as with any other proper name) started making surprise appearances on campus in the weeks after “mascot tryouts” were held in the Lang Performing Arts Center in late March. 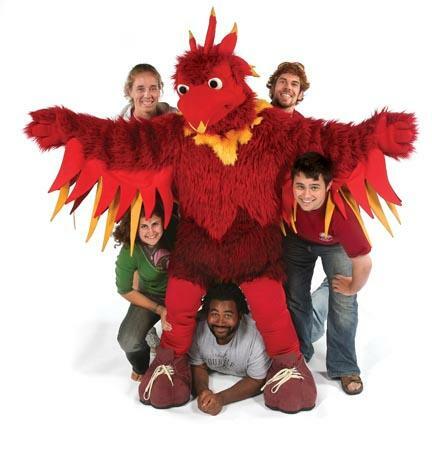 The mascot team (clockwise from beneath the bird): Joel Tolliver ’10, Juliana Macri ’09, Melissa Grigsby ’09, Dan Hodson ’09, and Scott Storm ’08. The identity of the person in the furry suit will always be a secret. About 200 students turned out to watch as emcees Claire Melin and Kyle White (both seniors involved in making the mascot happen)—put seven would-be birds through a series of absurd performance exercises designed to, well, sort out the fryers from the broilers. The judges included Registrar Martin Warner, Associate Dean Myrt Westphal, Assistant Track-and-Field Coach Tom Reynolds, Suneal Bedi ’09, Maggie DeLorme ’10—plus, special guest Dave Raymond, emperor of fun and games at the Raymond Entertainment Group and, for 16 years, the original Phillie Phanatic. Emperor Dave’s Newark, Del., firm designed and built the Phoenix. The fun began in late March as students auditioned for the role of Phoenix. Dan Hodson (left) paints a face. First, there’s the talent portion of the competition. A brave Finlay Logan ’08 (who later turned out to be an embedded reporter for The Daily Gazette) leads off, crooning a Gothic Archies’ ballad that ends: “One would rather be a tick than be a tiny goat.” As Anna Baeth’s [’09] cheering section roars encouragement, she hurries down a line of 15 audience volunteers, popping everyone’s collar in just 13 seconds. Juliana Macri ’09 describes the mythical phoenix’s curative powers, channels the spiritual bird in her tears, and revives two Swarthmore athletes who have “brutally injured” themselves. It’s a miracle! Dan Hodson ’09 shows off his skill at face painting with four volunteers—two “Haverfords” being decorated with tears of humiliation while two Swatties get (left to right on four cheeks) S-W A-T. These young people are so clever! Caitlin Mullarkey ’09 role plays with two Swarthmore “athletes” and two from Haverford: “Why did you go to Haverford?” she asks. “Because I got under 1,000 on my SATs.” Multitasking Alex Gilbert-Bono ’10 lip-syncs “Be True to Your School” while dancing, blowing into a beer bottle, and clanging a cowbell. 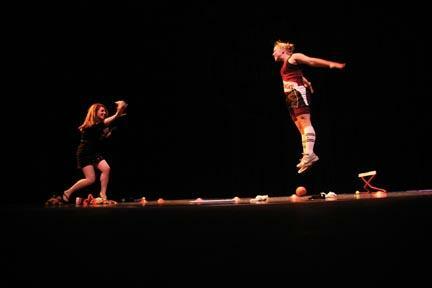 Melissa Grigsby ’09 does a deeply affecting ribbon dance to “Make It Rain” by Fat Joe and Li’l Wayne. And Scott Storm ’08, closing this portion of the competition with hints of the young Chris Farley of Saturday Night Live fame, does a wild ninja dance while completing a giant crossword puzzle that ends up spelling out PHOENIX. Anna Baeth ’08 (right) shouts “I’m a star,” while being pummelled with Beanie Babies by emcee Claire Melin ’08. Finally, there’s the “pep” portion of the program, in which each of the contestants must get the audience to cheer, stomp, and shout without saying anything. (This phoenix is mute.) At the end, everyone is on their feet while Storm smashes a piñata and strews candy across the orchestra seats. Don’t tell me that there’s no fun at Old Swarthmore. After five “winners” are announced (there will be a second round of auditions the next day), the speakers blare “Hot, Hot, Hot,” and the Phoenix appears, prancing across the large stage with professional abandon. It’s the first time anyone has seen the brand-new mascot, and there’s a standing ovation for both the student performers and the big, red bird, which shakes its feathered booty until the curtain closes. At Sunday’s second audition with Raymond, which includes a chance for additional aspiring avians who could not attend the previous evening. In the end, a team of five are selected to perform as the Phoenix: Hodson, Grigsby, Macri, Storm, and Joel Tolliver ’10. “We’ve found a very talented group of people who will be highly motivated to promote the mascot and Swarthmore pride!” says White, who, with a core group of students—some of whom have already graduated—has been pushing the mascot concept for three of his four years at Swarthmore. The idea began with the Student Athlete Advisory Committee in 2005–2006, proceeded to a student vote on various mascot nominations, followed by a student design contest. The Raymond firm was hired in mid-2007 to refine the students’ ideas and create the costume. Raymond’s team will also provide training and support for the Phoenix team. The students will have complete charge of the Phoenix—developing the bird’s personality, practicing with each other, scheduling appearances, and making sure that the mascot represents Swarthmore’s fun side. 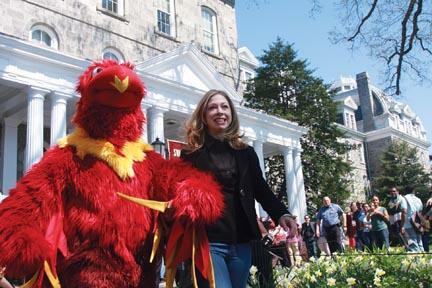 The Phoenix escorted former first daughter Chelsea Clinton to the platform when she visited campus during the Pennsylvania primary election. Apparently, the answer is “yes.” It rises from the ashes every once in a while.